A steady decline in the use of solvents in industrial manufacturing processes and therefore liquid solvent waste inputs, meant Geocycle could no longer rely solely on the chemical blending of materials to meet fuel specifications. The need to develop another process was identified and, after a detailed worldwide research, the Superblender was commissioned. An adaptation of an American plant, the Superblender resembles a giant sized kitchen blender, able to take highly viscous and solid waste materials, and through fierce agitation and a high-speed cutting blade, homogenise them into pumpable high viscosity fuel (HVF). 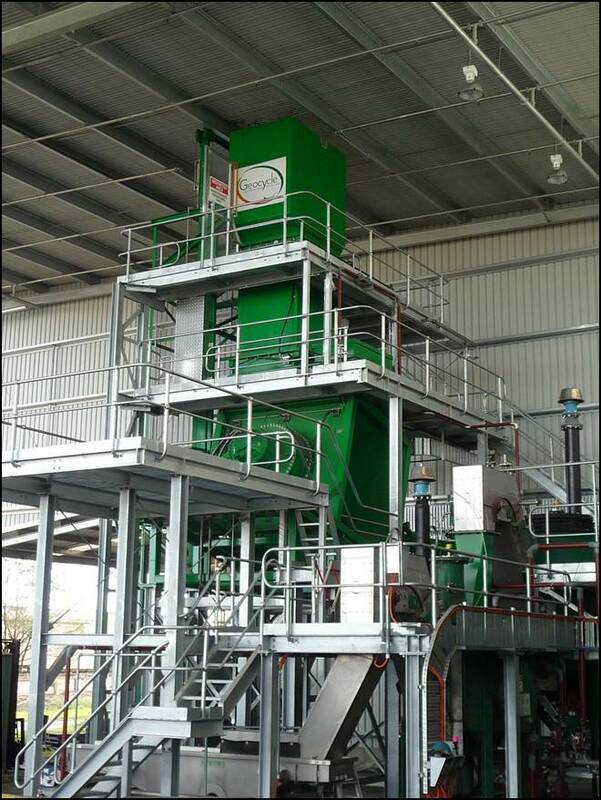 It consists of a unique system for shredding drums/containers of liquids and solids, firstly blending the wastes into a uniform high viscosity fuel, and then recovering the washed drum/container metal for recycling. The process can shred almost anything - from small bottles to 200 litre steel drums of solid resin as well as 1000 litre IBC’s. Shredded material is extruded into the superblender for primary fuel blending via a hydraulically powered variable high speed dispersion rotor capable of 300 rpm which has the effect of separating the metal from the sludge/solids. Metal is removed from the superblender via a magnet conveyor and deposited into a smaller caustic wash tank and finally through a final washing cycle to be collected and sold as scrap for recycling. The sludge/solids are blended with a lighter liquid solvent to form the primary formulation ingredient for a batch of high viscosity liquid kiln fuel (HVF). The system is fully automated and capable of processing 5-6 tonne/hour of steel drums and can produce 40 tonne of liquid kiln fuel in a 8 hour shift and is controlled by a Citect Scada system via a local control panel. Drum shredding is performed in an inert (nitrogen blanketed) environment to mitigate the risk associated with sparks in a flammable atmosphere and all electricals/instrumentation are rated for use in a hazardous area. A fully enclosed process, the Superblender almost completely eliminates the manual handling and opening of containers which has significantly contributed to the achievement of safety, health and environmental best practice. The process has been developed in alignment with the Victorian EPA’s strategy of diverting waste from landfill and in Geocycle’s case, reusing this waste as a coal alternative in the powering of Cement Australia’s cement kilns. The Superblender has been a great success story for Geocycle and more importantly the environment, producing a high viscosity liquid fuel from previously unprocessable material, along with the flexibility to utilise the fuel in our existing SBF programs or as a dedicated HVF streams.